“Live Worm” orders are either sent by Express post or packaged inside a worm farm, unless alternative arrangements are agreed with the customer. E.G. Bulk orders. Express post postcodes are next day delivery, whereas outside the network, they can take up from 2 to 4 days to be delivered. In the event your postcode falls outside the express post network, your products may not be scanned for tracking purposes and you will need to contact your local post outlet. 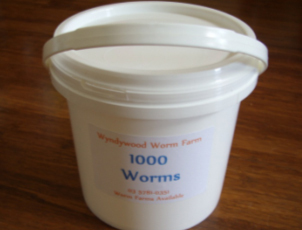 All worms are packed and leave Wyndywood worm farm in a perfect, healthy condition and therefore we can not be held responsible for the actions of others. It is then the soul responsibility of the customer to track and collect the worms from Australia post if delivery was unsuccessful to the address advised by the customer. Pick up from the PO must be on the day of the attempted delivery or no refund will be given in the event of the worms dying. Anytime after, it will be deemed that the customer has unfortunately killed the worms and no refund will be given. In the case of worm farm/worm package deals, the worms will be sent inside the farm and may take longer than the express post deliveries, but the same principle of notifying us on the day of delivery if there is any concerns still applies. The worms are much safer in the farm, than sent via express on their own. Our compost worms consist of Red, Blue and Tiger worms. These species breed rapidly in ideal conditions and will eat anywhere from 50% to 100% of their own body weight every day. They all work happily together in your worm farm, doing their own little part in the compost heap to help breakdown all decomposed matter. We recommend not putting any food that is very acidic into the worms environment, whether it be a worm farm or compost heap with worms in it. All citrus, onions, tomatoes etc may sour the worms environment, making it too acidic, therefore making the worms leave for greener pastures or they may even die. The Wyndywood bokashi Bin is ideal for these types of acidic food scraps. Please refer to Bokashi Page of this website. A handful of dolomite every couple of weeks added to your worm farm will neutralize acidity levels built up because most fruits and veges have some form of acid in them. Some more than others. More worm facts are in our facts sheets which are provided in our VermiHut worm farms. Compost worms can also be used for fishing. Even though they cant get to the sizes of scrub worms etc, they can still be used for other qualities they possess. For instance, a blue worm has only a very small body and long tail, or bowel tract, so there is plenty of worm to hook without killing it. The blue worm is also very light sensitive and wriggles around vigorously when exposed to sunlight. This movement would attract the fish when on a hook. So rather than paying big dollars every time you went fishing for a little container of worms, why not start up your very own worm farm and never pay for worms again. Our compost worms are sold in 3 sizes. Other bulk orders can be arranged.